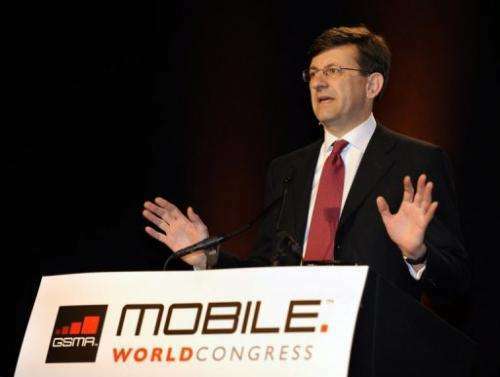 Vittorio Colao CEO of Vodafone gives a speech in Barcelona on February 17, 2009. Colao said Tuesday that the British mobile phone giant's $130-billion (99-billion-euro) Verizon Wireless deal would help strengthen its strategy, boost infrastructure investment and slash debt. Vodafone chief executive Vittorio Colao said Tuesday that the British mobile phone giant's $130-billion (99-billion-euro) Verizon Wireless deal would help strengthen its strategy, boost infrastructure investment and slash debt. "I really believe that this is a good transaction. I think the value is good also for Verizon," Colao said in a conference call to analysts, one day after unveiling the vast deal to sell Vodafone's 45-percent stake in its US joint venture to partner Verizon. "It's one of those cases which turns into a win-win and I do believe that it leaves Vodafone the same as before with a stronger balance sheet, with an appealing set of countries and the possibility to accelerate, to spring ahead and become again a leader." Vodafone said Monday that it would return $84 billion of the funds it receives back to shareholders and plough over $9 billion into organic investments over the next three years to improve its networks and services. Colao revealed on Tuesday that Vodafone would also slash its debt by about $20 billion as a result of the blockbuster deal. "This is a fantastic transaction which allows us to strengthen our existing strategy but we are not changing the strategy," he added. The chief executive said Tuesday that Vodafone would boost spending on "mostly infrastructure investment, shops mainly." 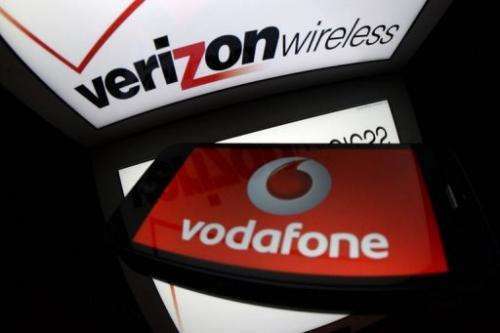 A picture taken on September 2, 2013 in Paris, shows an illustration made with the logo for Verizon Wireless and the logo of mobile network provider Vodafone. Vodafone chief executive Vittorio Colao said Tuesday that the British mobile phone giant's $130-billion (99-billion-euro) Verizon Wireless deal would help strengthen its strategy, boost infrastructure investment and slash debt. He added: "Despite the tough macro environment in Europe and the ongoing uncertainties, we believe that consumer demand for data (...) will continue to grow very quickly. "Vodafone is positioning itself now to maximise the opportunity it represents for telecom operators." Back in June, Vodafone launched a 7.7-billion-euro cash offer for Kabel Deutschland, Germany's biggest cable operator, in a bid to grow in Europe.